Odum Raja Aadum Rani malayalam movie directed by debutante Viju Varma featuring Tini Tom and Manikandan in lead roles has started rolling in Palakkad. Sreejith Ravi, Biju Kuttan, Sunil Sugatha, Sreekumar, Kochu Preman, Kottayam Nazeer, Kannan Pattambi, Vijayan Peringodu, Roy Mathew, Murukan Saji, Sajeev Madhavan, KPSC Lalitha, Kulapulli Leela, Manju, Surabhi, Amalendhu and Teena will also be seen in prominent roles. For the lyrics of Engandiyoor Chandrashekaran Pramod Cheruvathu has set the tunes. 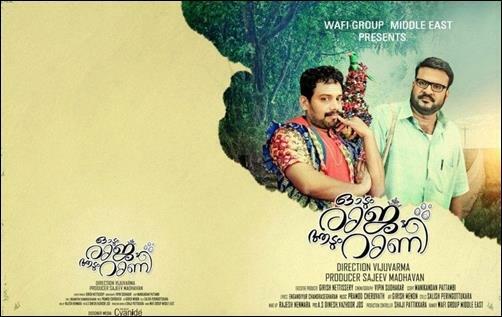 Wacky names are not new in malayalam film industry. Adding one more to it is 'Odum Raja Aadum Rani' directed by debutante Viju Varma. As the name suggests, the movie has two main characters. Even though creamed with humour, the movie discusses some serious issues. In course of time, Odum Raja Aadum Rani' calls out the identity of homosexuals, the problems faced by them and also the attitude of the people towards them. Venkidi(Tini Tom) is a person who sells clothes, cosmetics and other predominantly female utilities. Due to his high contact with ladies, Venkidi is too much interested in them too. As his profession demands Venkidi cannot stay in one place for long and have to move from place to place. Thus he gets the name 'Odum Raja'. He is such a person who enjoys life and lives without any regrets. As Venkidi was a a person who has an eye for women, he mostly lands in problems. During an occasion, Venkidi happens to meet Thamburu(Manikandan Pattambi) who was a Karagattom dancer with feminine side hidden in him. Thamburu who was living in isolation got extra oxygen as Venkidi enters his life. Later they became friends which open doors for some interesting events. Once, the two individuals were forced to share a room. As the two personalities had dissimilarity in their personality, there arise some interesting humorous situations as Thamburu takes a liking for Venkidi. As both characters are from the Tamilnadu-Kerala border, Tamil influence in embedded on them. The makers are trying to rope Mythili to play the prominent female character. Sreejith Ravi, Biju Kuttan, Sunil Sugatha, Sreekumar, Kochu Preman, Kottayam Nazeer, Kannan Pattambi, Vijayan Peringodu, Roy Mathew, Murukan Saji, Sajeev Madhavan, KPSC Lalitha, Kulapulli Leela, Manju, Surabhi, Amalendhu and Teena will also be seen in prominent roles. For the lyrics of Engandiyoor Chandrashekaran Pramod Cheruvathu has set the tunes. Vipin Sudhakar has helmed the camera. The movie is being produced by Sajeev Madhavan under the banner of Wafi Group Middle East.